A lot of writers have a Flashfic Friday section on their website. I don’t. Not because I don’t like flashfic, but mostly because I don’t consistently write enough of it to have something new every Friday. When that changes, I might join in, because flashfic is fun. Last spring, as matters were falling over themselves as usual, J. Scott Coatsworth invited me to take part in the 4th Queer Sci-Fi flashfic contest. 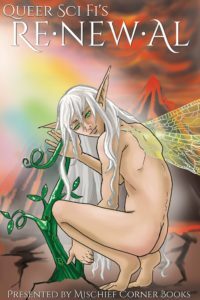 The challenge was to write a 300 word flashfic – scifi, fantasy, paranormal or horror, with queer characters – on the theme of renewal. At first, and for a long while after, I was thinking of chickening out. I had too much on, I’d only just started writing fantasy again, I had… I had… I had… Then, despite all the denials, the ideas started coming. I remembered that I used to love writing flashfic and realised I’d not done anything like this in far too long. In the end I had a handful of stories to choose from and I picked one and sent it off. Fast forward a few months… and I’m sitting here reading a whole book of fabulous flashfic. All writers had the same theme to work with. Each one had 300 words to tell their story. And the results are as diverse as 200 people can get. I’m rather chuffed I told my inner chicken to shut up, because being part of something like this is fun. And getting the email telling me that my flashfic story made it into the anthology was… unexpectedly sweet. So if flashfic does it for you… check this out!